Chris Hartley, the Queensland wicketkeeper, has been named the Sheffield Shield Player of the Year following an outstanding season with bat and gloves. Hartley accepted the award at the MCG on Monday before turning his attention to Wednesday's Shield final against Victoria. Hartley collected 17 votes during the season to pip Damien Wright (16), the Victoria bowler, and New South Wales' Phillip Hughes (14) for the top prize. The Bulls have relied on Hartley throughout their campaign and his 774 runs are a record for a Queensland wicketkeeper in a season. He also took 41 catches to be behind only Luke Ronchi on the list of dismissals. 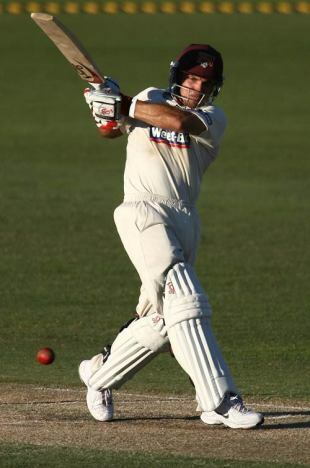 Victoria's Brad Hodge was the FR Cup Player of the Series while David Warner and Kieron Pollard shared the Twenty20 prize. South Australia had another trophy-free campaign on the field but they were recognised with the Benaud Spirit of Cricket honour for their hard but fair play. New South Wales collected the women's version of the award. South Australia's Dan Christian, who made his Twenty20 international debut last month, was the Lord's Taverners Indigenous Cricketer of the Year and Steve Davis won the Cricket Australia Umpire award. Sarah Elliott, Victoria's middle-order batsman, was the WNCL Player of the Series while Alex Blackwell, the Australia captain, was recognised for her exploits in the Twenty20 tournament. The Australian Cricketers' Association teams were also named at the function. ACA four-day team of the year Ed Cowan (Tas), Phillip Hughes (NSW), Michael Klinger (SA), George Bailey (Tas, capt), Usman Khawaja (NSW), Steven Smith (NSW), Chris Hartley (Qld), John Hastings (Vic), Ben Cutting (Qld), Trent Copeland (NSW), Peter George (SA), David Hussey (Vic, 12th man). ACA one-day team Michael Klinger (SA), Phil Jaques (NSW), Brad Hodge (Vic), George Bailey (Tas, capt), Lee Carseldine (Qld), Travis Birt (Tas), Matthew Wade (Vic), John Hastings (Vic), Xavier Doherty (Tas), Ben Cutting (Qld), Nathan Rimmington (Qld), Daniel Christian (SA, 12th man). ACA Twenty20 team Shaun Marsh (WA), David Warner (NSW), Brad Hodge (Vic, capt), Tim Paine (Tas), Kieron Pollard (SA), James Hopes (Qld), Chris Simpson (Qld), Daniel Christian (SA), Aaron Heal (WA), John Hastings (Vic), Shaun Tait (SA), Brad Knowles (WA, 12th man).